Alpine pastures, quaint monasteries against dramatic backdrops of pine-clad mountains, panoramic vistas of stunning landscapes, Lachen is a paradise waiting to be discovered. Here’s our guide to the place. Lachen (meaning ‘big pass’) in North Sikkim will stun you with its beauty. Start your stay with a tour of the quaint Lachen village with old wooden homes built on stone bases and decorated with multi-hued, Tibetan-styled window frames. Use this time to get acclimatised to Lachen’s height of 9,000 ft, before you head to Thangu and Chopta Valley at 13,000 ft and finally to the stunning Gurudongmar lake which is at a whooping 17,000 ft. At Thangu Valley, revel in the sight of alpine meadows dotted with marigolds, orchids and rhododendrons; flanked by the shimmering water of River Teesta and wooden houses with colourful roofs. If you have the time then gear up for a two-hour trek to the stunning caves that were used for meditation by Alexandra David-Néel, the famous Belgian-French Buddhist traveller. For the thrill seekers, do not miss the annual yak race that happens here during summers. A little over 2 kms from Thangu lies Chopta Valley. Lose yourself in the majestic views of the snowy peaks. An ideal place for trekkers and explorers, the valley is also a safe haven for rare species of birds and animals. 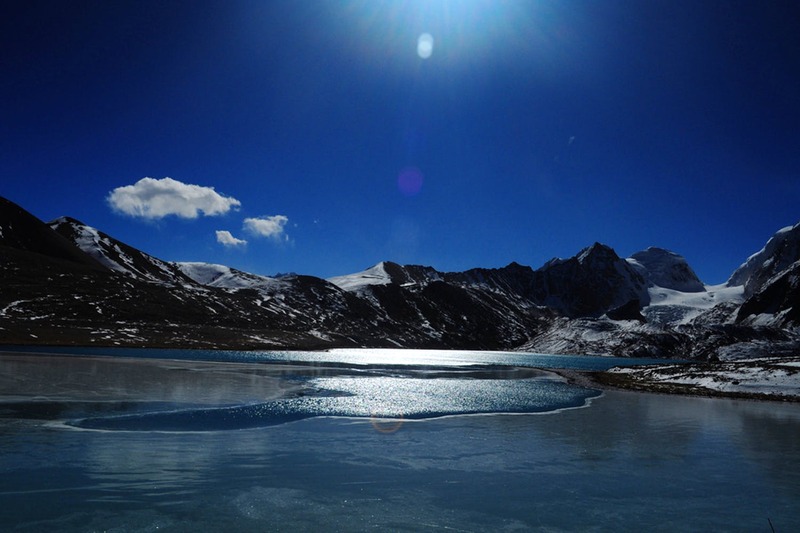 About 30 km north of Chopta on the Tibetan border, lies the stunning Gurudongmar Lake, one of the highest lakes (17000 ft) that will leave you breathless (also literally so!). The lake is a pilgrimage site for both Buddhists and Sikhs. There is a part of the lake that never freezes even in extreme winters, which according to legend, is the spot where Guru Dongmar bathed in while on his way to Tibet. The altitude can be dizzying so stay hydrated and warm. Although not fancy, the accommodation options in Lachen will provide you with quality comforts, great food and warm hospitality. Apart from several deluxe and medium hotels in Lachen, you can also choose to stay in lodges and PWD bungalows of the Forest Department. Set in the midst of an apple orchard, this resort provides all modern amenities and also has a multi-cuisine restaurant. Meticulously designed, spacious rooms with luxurious comforts and pure vegetarian meals. (Call: 094340 54777. Website: https://www.himalayanresidency.com/destinations/lachen/). Hotel with an old countryside charm and a rooftop restaurant where you can dig into some scrumptious meals while enjoying the panoramic view of the city. A budget hotel with graceful décor and deliciously cooked meals. Another decent budget hotel with most modern comforts and in-house meals. Located in the district of North Sikkim, Lachen lies at a distance of 117 km from Gangtok. You can fly from Kolkata to Gangtok and hire a car to take you from Gangtok to Lachen, which is a 4-hour drive. Alternatively, you could fly to Bagdogra and drive from Siliguri to Lachen, which is a longer drive of 7 hours. Driving is pretty much the only way to explore North Sikkim. The best time to visit Lachen is from March to June. If you don’t mind colder temperatures, then travel between September and December, when the landscape is stunning.